Less than a week later, we came back to sunny Toronto to attend the 2018 Polaris Music Prize gala at The Carlu on September 17, 2018. 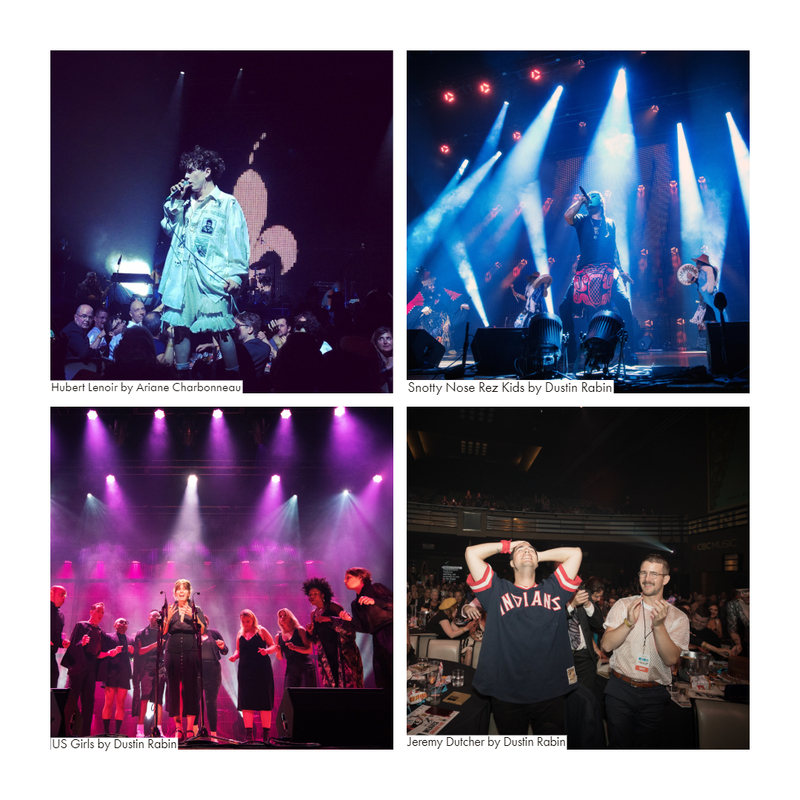 A longstanding Stingray Music partner, Polaris Music Prize is a not-for-profit organization that annually honours and rewards artists who produce Canadian music albums of distinction. A select panel of music critics judge and award the Prize without regard to musical genre or commercial popularity. A full house at the historic Carlu welcomed jaw dropping performances by eight of the 10 Polaris nominees. These included Jean-Michel Blais, Jeremy Dutcher, Hubert Lenoir, Pierre Kwenders, Partner, Snotty Nose Rez Kids, U.S. Girls and Weaves. Daniel Caesar was also apparently in attendance and Alvvays were represented by Deep Vvaters, a band from Toronto’s Girl’s Rock Camp. From table crashing to acapella performances, the crowd also witnessed several testimonials on behalf of various nominees, including some from past Polaris winners. Arcade Fire’s Win Butler spoke on behalf of Kwenders, Karkwa’s Louis-Jean Cormier supported Lenoir and Tanya Tagaq advocated for Weaves. Babyface, George Stroumboulopoulos, Safia Nolin and Gang Gang Dance’s Lizzi Bougatsos were some of the evening’s other testifiers. The 400 guests also had the chance to hear Stingray Music’s Collaboration Session with Jennifer Castle and The Weather Station, featuring an interview with our very own Zac Monson and a performance of “I Tried to Wear the World”. Make sure to watch the interview & performance made possible by our Stingray Rising Stars program! But as the evening was coming to an end, it was time to announce the long-awaited winner. It was last year’s winner, Lido Pimienta, who had the honour of announcing her Polaris Music Prize winning successor. Jeremy Dutcher was selected by an 11-member Grand jury as the Canadian album of the year and was be awarded $50,000. He gave a heartfelt and wise speech, using his moment in the spotlight to remind people why he made the album, a mix of his own interpretations of traditional songs sung in the Wolastoq language. He also spoke of an Indigenous renaissance and we couldn’t agree more! Each of the nine other Short-Listed artists received $3,000 courtesy of Slaight Music. Past winners are Lido Pimienta (2017), Kaytranada (2016), Buffy Sainte-Marie (2015), Tanya Tagaq (2014), Godspeed You! Black Emperor (2013), Feist (2012), Arcade Fire (2011), Karkwa (2010), Fucked Up (2009), Caribou (2008), Patrick Watson (2007) and Final Fantasy / Owen Pallett (2006). A Wolastoqiyik (Maliseet) member of the Tobique First Nation in New Brunswick, Jeremy Dutcher studied music and anthropology at Dalhousie University. The classically trained tenor and composer recorded “Wolastoqiyik Lintuwakonawa” following a five-year research project on old archival recordings of traditional Maliseet songs at the Canadian Museum of Civilization, many of which are no longer being passed down to contemporary Maliseet youth. The artist studied these 110-year-old wax cylinder phonograph recordings of his ancestors for weeks inside the museum, meticulously transcribing the recordings once collected by William H. Mechling. The anthropologist lived among Dutcher's ancestors for seven years in the early 1900s, capturing the songs and voices of the community. Many of the album's songs also sample the original recordings as part of the backing tracks.